Left: Sugra, who is famous for singing "Jujalarim" at the "Decade of Azerbaijani Art in 1959" in Moscow poses 38 years later at age 50 (1997). In May 1959 almost 40 years ago, there was a huge festival in the city of Moscow called the "Festival of the Decade of Azerbaijan Art." All the best music and songs and dances from Azerbaijan were performed there. Moscow is the capital city of Russia, and at that time it functioned like a heart in the huge country called the Soviet Union. The country was so large, in fact, that when it was lunch time (1:00 pm) on the west coast, it was already very dark and late at night (11:00 pm) and long past bed time for kids on the east coast. The Soviet Union was three times wider than the United States, which has only three time zones from coast to coast. Such a big country the Soviet Union used to be! But Azerbaijan was tiny! It was only one of the 15 republics that made up the Soviet Union. To get to Moscow from Baku, the capital of Azerbaijan, you had to take a train for almost three days and nights. Now one of the songs that Azerbaijanis wanted to perform at the festival was a song called "Ju-ja-lar-im" (My Little Chicks). It's a little kids' song about a mother hen who takes good care of her little chicks, making sure that they get enough food and water. It's fun to sing. That's why we've put the music here for you. 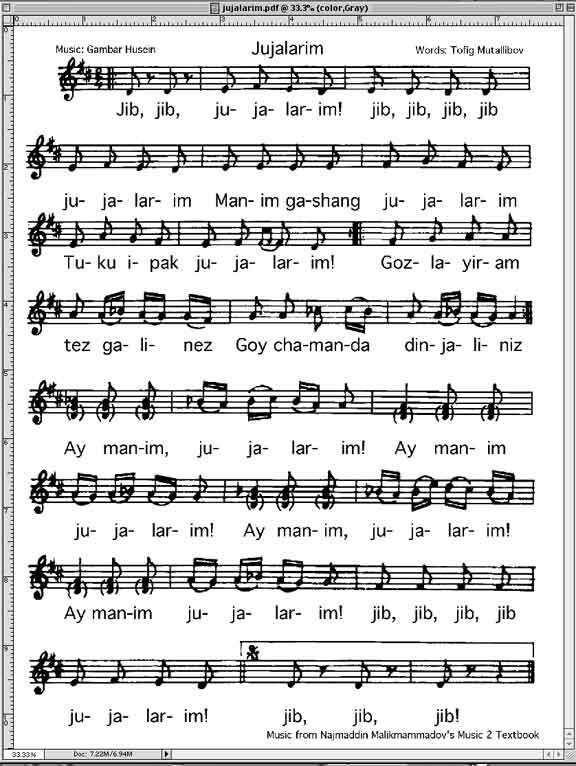 Tofig Mutalibov (pronounced TOH-fig moo-TAH-lee-bov) wrote the words to the song and Gambar Huseinli (pronounced "gam-BAR hoo-SEHN-lee") wrote the music. Berta Brailovskaya (pronounced BER-ta bra-ee-lov-SKY-ya) taught the children how to dance to this song. But she wondered who could sing the solo in front of such a big crowd at such an important event. Whoever she chose had to be the very best performer because she would be representing Azerbaijan in front of all the people of the Soviet Union. Mrs. Berta thought about it for a long time. Finally, she chose Sugra (pronounced SUE-gra) out of 150 children. Sugra was 12 years old at that time. She was pretty. She had long brown hair, smiling eyes and a strong, happy voice. Everybody in Azerbaijan would be listening to Sugra on the radio. She would have to sing loud so that people could hear her when the orchestra was playing. The big questions wascould she do it? Sugra loved to sing. She loved to dance. So she was the one they chose to "take care of the little chicks." She would sing all the solo parts all by herself, and then the other children would join together and sing the chorus. It wouldn't be easy to sing when hundreds of people were watching on stage and millions were listening on the radio all over the Soviet Union, not only in Azerbaijan but in many other places as well. Not many people had television back then in 1959, but most people had radios. What if Sugra made a mistake? She had to remember all the words to the song. She had to remember to smile and look relaxed and self confident even if she felt weak and nervous inside. She had to remember all the dance steps. Could she do it? She worried and her mom worried, too. The last ten days before the festival, everybody practiced so long and hard. They practiced from morning to night, day after day after day. They only went home just to jump into bed and get sleep before practicing again the next day. But during all those days, they would only let Sugra sing two lines-no more. "Don't strain your voice," the teachers warned. Everybody was telling Sugra what to do. "Don't sing! Save your voice! Don't play with other kids, you might get sick! Don't get too tired! Don't drink hot drinks like tea! Take care of your voice! If something happens to you, the whole song will be ruined!" Everybody treated her very specially. When all the other 150 dancers and the choir members got to take one family member to Moscow, Sugra got to take two-both her sisters-Elmira and Nazly. When all the kids sat in the regular section on the train, Sugra sat in the special compartment with the teachers. When the train stopped in the mountain town called Minvody, which means mineral water, everybody jumped off the train to go buy the famous ice cream there and drink the clear, cool sparkling water. But not Sugra. The teachers wouldn't let her go. "Watch out for your voice," they warned. "Cold ice cream will hurt your voice." So she sat alone on the train. She was so sad. But then she thought about her big responsibility. Finally, they arrived in Moscow and the day of the festival arrived. The performance would be at Moscow's most famous concert hall, the Bolshoi Theater. So many people wanted to see the show that it was very difficult to get tickets. When the Master of Ceremonies announced "Jujalarim," everybody started cheering and clapping. Then Sugra came out on stage and all the little chicks followed. They were the little kids, who were five and six years old, all dressed up in yellow costumes. They danced around on stage, nodding their heads up and down, pretending they were little chicks drinking water and pecking at grain. Then the orchestra started playing and Sugra began to sing. Everybody liked the song so much that by the second verse, they started to sing, too, "Ay, man-im ju-ja-lar-im" (Oh, my little chicks!). Everybody was laughing and clapping. Now, at these festivals in Moscow, no group is ever allowed to perform twice. There isn't enough time. Too many other music pieces are planned for the program. But when the "Jujalarim" group performed, all the people clapped and clapped. So Sugra and the little chicks along with the dancers and the choir-150 children in total-came out on stage to sing and dance, again and again and again-four times! Sugra was the star! She had succeeded. Her Mom was listening on the radio back in Baku exactly at the same time that Sugra was singing. She was so happy for Sugra that tears were rolling down her cheeks. The Azerbaijani orchestra was led by Azerbaijan's famous conductor Niyazi (pronounced nee-YAH-zee). Niyazi was so happy that he started dancing even while he was leading the orchestra. After this big success in Moscow, "Jujalarim" became very popular with children in many countries, especially in the former Soviet Union. Besides the Russian language, the song was also translated into English, German, Japanese, Bulgarian, Polish, Serbo-Croatian (spoken in Yugoslavia) and Romanian. The Jujalarim Ensemble traveled to many countries in Europe to perform at children's festivals and competitions. They always came back with prizes. For example, in 1969 they performed at the International Children's Festival in Yugoslavia where they won the gold medal. Sugra always went on these trips. South of Azerbaijan is a country called Iran. Back when Azerbaijan was part of the Soviet Union, people were not allowed to cross the borders to go to Iran, and people from Iran were not allowed to cross the border into Azerbaijan. But people could listen to the radio. Radio waves could cross the borders. And so, Azerbaijanis who were living in Iran-there are millions of them- listened to Baku radio. They liked the song, too. And the Azerbaijani kids started singing it in Iran. Mr. Alvandi, an Armenian, who lived in Iran also listened to Baku radio. He heard the Jujalarim song, too, and decided to translate it into Persian and teach his two little daughters, Alice and Bella. Every morning from 7:00-7:30 AM, he had a little children's program on the radio. So he recorded Alice and Bella singing the song while he played the piano and Yusef Shahab played the accordion. Mr. Shahab, who now lives in Los Angeles, was 16 years old at the time. The Persian children in Iran came to love this song, too. They called it "Ju-je-ha-yam". "Ju-je" means "little chick" in Persian just like "Ju-ja" does in the Azeri language. And that's how a kid's song crossed the borders when people weren't even allowed to. And that's how the song spread all over Iran. Children and adults in Iran still sing this song. It's a song that has passed like a gift from one generation to the next. Children today sing it with as much joy and enthusiasm as their parents and grandparents did because it's impossible to sing "Jujalarim" any other way. Well, almost 40 years have passed. Some of the eight other little "chicken girls" that performed with Sugra-like Chimnas Babayeva and Leyla Shiklinskaya-grew up to become famous ballet dancers. And Sugra Bagirzade, who is 50 years old now, is still so pretty. She got married and has two daughters who learned to sing "Jujalarim" many years ago when they were small. Sugra became an actress who starred in many movies. Now she has a special television program just for kids! Azad Sharifov and Jala Garibova, who both live in Baku, also helped us with this article as did Mina Naraghi of Los Angeles, who learned this song as a child when she used to live in Iran. Sugra Bagirzade helped us find original photos from films that she starred in nearly 40 years ago as well as the original music that you can listen to on the WEB.